The O'Connor Clan at Miles For Matheny 2009. 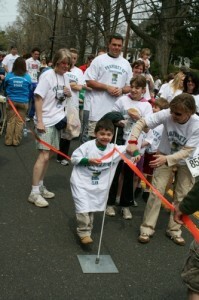 Register and raise donations online for Miles for Matheny by logging onto www.milesformatheny.org. Set up your own home page, which allows you to easily reach out to your family, friends and business associates to support you. Your sponsors’ names and gift amounts will be recorded automatically for you. Monitor your fundraising activity online and watch as you reach your personal fundraising goal! Prizes are awarded for top fundraising individuals and teams. Tips are offered online. You can also call Patricia Cats at (908) 234-0011, ext. 260, or email her at pcats@matheny.org. Miles for Matheny is being held Sunday, April 22, at Liberty Park in downtown Peapack, NJ. All proceeds from this event will benefit the Matheny Center of Medicine and Dentistry, which provides medical, dental and therapy care to Matheny inpatients and people with disabilities in the community. Activities include five Cycling Routes, a 5K Race, Kids Fun Run and the Lu Huggins Wheelchair Walk. Major sponsors are Poses Family Foundation; Affinity Federal Credit Union; Archer & Greiner P.C; BP Fueling Communities; WCBS-TV/WCBS Newsradio 880; Partlow Insurance Agency; Peapack-Gladstone Bank; and Porzio Bromberg & Newman P.C. This entry was posted in Uncategorized and tagged Miles for Matheny, Patricia Cats. Bookmark the permalink.